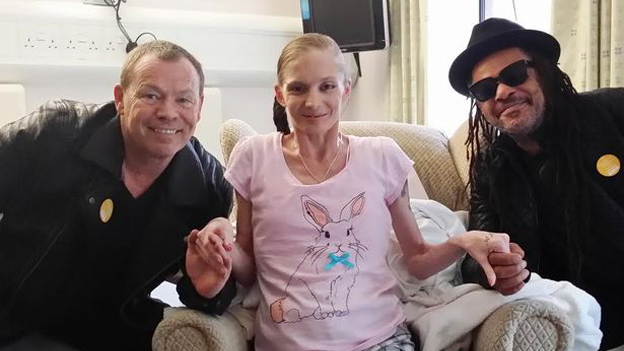 A brave mum had her dying wish come true after her favourite band UB40 paid a surprise visit to her hospice bedside after a worldwide social media campaign. 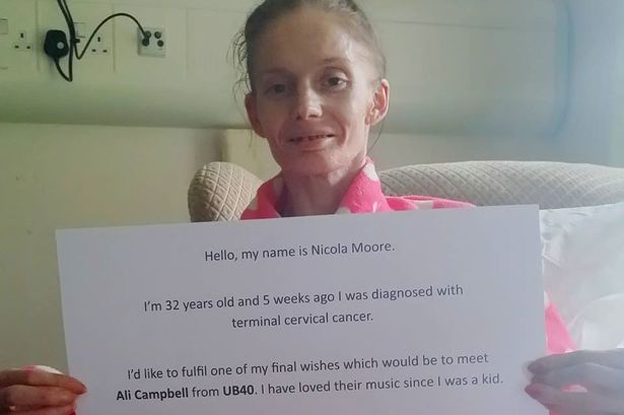 Singers Ali Campbell and Astro dropped in on Nicola Moore - diagnosed with terminal cervical cancer just five weeks ago - after an appeal to meet her idols went viral. Nicola, 32, had posted a heartbreaking picture on Facebook yesterday of her holding a sign saying she would love to meet the Birmingham musicians before she died. Less than 24 hours later 2.5 million people had seen the post from the Dudley mum-of-two including Dawn Wilson, the wife of Astro - who contacted the hospice to organise a surprise visit. “I feel like I’ve come alive again, I feel stronger,” said Nicola who was glowing with joy after the visit. Nicola sang her favourite song, Rat in the Kitchen, to Ali and Astro, who told her that she had a ‘fantastic voice’ during the visit to the Wolverhampton hospice. The singers also revealed they had received thousands of messages from their fans about the appeal. Nicola, who has two children aged 12 and 19 months, was diagnosed with cervical cancer after experiencing a pain in her leg, and was struggling to walk. Sadly, despite undergoing radiotherapy treatment she was told her cancer was terminal five weeks ago. As well as meeting UB40, her bucket list includes plans to make memory boxes for her children, getting a glass engraving for her Mum, and visiting the seaside. Grace Ruston, PR Manager at Compton Hospice, said: “It’s been absolutely incredible. In less than 24 hours it’s gone from one lady’s wish, to becoming a reality. “At the hospice, as well as medical treatment to ease pain we offer emotional support, and often part of that is to try and help fulfil people’s last wishes. “Since posting Nicola’s picture on our Facebook page the response has been overwhelming. “She was in total shock when the guys walked in, and just held her hands to her face. She is absolutely glowing, and the difference in her after their visit is just amazing. “It was amazing timing as the guys were only in Birmingham for one day before they have to head to London for rehearsals.